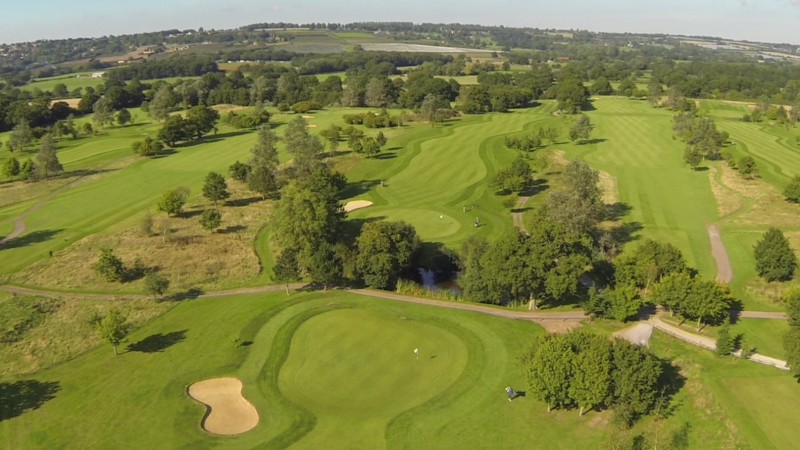 The Weald of Kent Golf Course is a picturesque par-70 parkland course situated on the outskirts of Maidstone, Kent. Onsite Facilities include the newly built 16 room hotel and an existing 19 room lodge. The lodge overlooks the ninth green and is popular with golf breaks of all sizes. A comfortable bar and restaurant area is available in the clubhouse with views over the surrounding lakes. A large fleet of electric golf buggies are available* to take the pressure of your feet and your game. All year round we are on main greens and tees*. We have an outstanding reputation for freshly made hearty dishes to make your day extra special, and our staff in the proshop and bar areas will offer a friendly welcome. The Weald of Kent specialises in society, corporate and charity golf days of all sizes and the well-stocked proshop (stocked by www.golfgeardirect.co.uk) guarantees online prices with in-store service. Golf days available 7 days a week. 1 in 12 players goes free of charge on a golf break. Come and experience our own memorable golf day. For further information log on to www.weald-of-kent.co.uk. *Terms and Conditions Apply. Golf Days welcome seven days a week. Book your summer golf day for as little as £26pp, which includes coffee and bacon baps on arrival. Winter societies from £21pp, including coffee and bacon baps. Make your day memorable by adding a 2 course meal and prize presentation after your golf. The Weald of Kent is located on the A274, exit the M20 at junction 8, through Leeds Village on the B2163 and turn left on the A274, the Weald is located 2 mileson the left-hand side. 18 hole adult weekday fee between 7-10am £26, after 12pm £20. Senior weekday fee £18. Twilight fee from £10. 18 hole adult weekend fee between 7-11am £33, after 12pm £27. Senior fee £27. Twilight fee from £10. 19 Room Lodge and a newly opened 16 room Hotel and fitness centre. Golf Breaks available from £85pp, two course evening meal, breakfast and 36 holes. Restaurant, hotel, conference centre, function rooms, weddings and golf tuition facilities.